Both Andrew Gillum and Bill Nelson lead by four percentage points, within the poll's margin of error. On the eve of Election Day, Democrats have a slight edge in Florida’s high-stakes Senate and gubernatorial contests, a new NBC News/Marist poll finds. At the top of the ticket, Democrat Andrew Gillum is up among likely voters against Republican Ron DeSantis, 50 percent to 46 percent, within the poll’s margin of error. 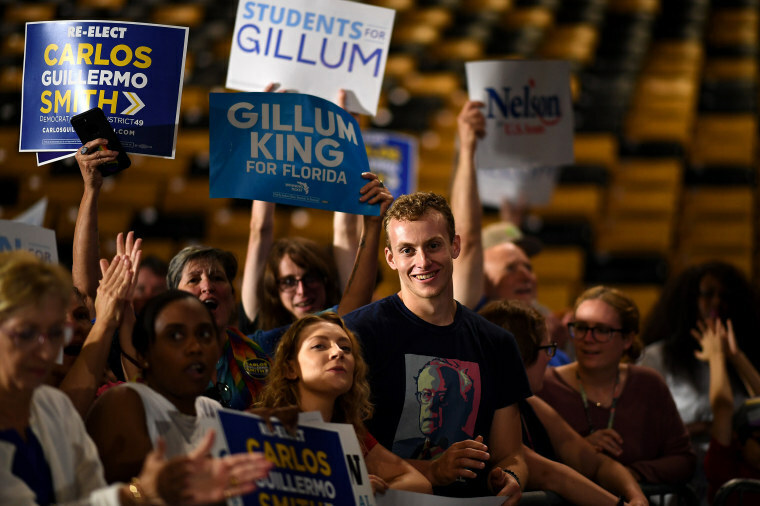 That’s a similar margin to the five-point lead NBC News and Marist found in September, when Gillum led 48 percent to 43 percent. Among all registered voters, Gillum’s lead increases slightly to five points, 50 percent to 45 percent. The margin is identical for Democrats in the closely watched Senate contest between incumbent Democrat Sen. Bill Nelson and outgoing GOP Gov. Rick Scott. Nelson leads Scott 50 percent to 46 percent among likely voters. Among the larger pool of all registered voters, Nelson leads 50 percent to 45 percent. In September, Nelson got 48 percent support to Scott’s 45 percent among likely voters. Both Democratic candidates also enjoy net-positive favorability ratings, while both Republicans are more disliked than liked. Gillum’s favorability stands at 48 percent favorable/40 percent unfavorable among likely voters. For his GOP rival, DeSantis, 43 percent of likely voters have a favorable impression of him, while 45 percent disagree. Nelson, who has served in the Senate since 2000, gets a favorable rating from 45 percent of likely voters, with 42 percent giving him a thumbs down. That’s compared with rival Scott’s 42 percent favorable/50 percent unfavorable rating. That net negative rating of -8 percent for Scott is a drop from a net positive rating of +1 percent in September. Asked which party they want in control of Congress after November’s elections, 49 percent of likely voters choose Democrats, while 45 percent choose Republicans. NewsWant more of NBC News’ best reporting? Sign up for the Morning Rundown newsletter. The positive news for Democrats comes as President Donald Trump’s job approval rating in the state is upside-down, with 44 percent of likely voters approving and 51 percent disapproving. That’s down from September, which put Trump’s approval rating in the state at 46 percent approve, 48 percent disapprove among likely voters. Trump has not shied away from urging Florida voters to vote for both Scott and DeSantis, stopping five times in the state this midterm cycle for Make America Great Again campaign rallies. Democrats in both races are performing better than their Republican counterparts with likely voters who are independents, minorities and women. Gillum leads DeSantis with likely voters who are independents (57 percent to 37 percent), African-Americans (91 percent to 7 percent), Latinos (51 percent to 44 percent) and women ( 58 percent to 40 percent). DeSantis leads with white voters (56 percent to 41 percent), men (54 percent to 42 percent) and seniors (52 percent to 46 percent). Similarly, Nelson leads Scott with independents (55 percent to 37 percent), African-Americans (82 percent to 8 percent), Latinos (56 percent to 41) and women (56 percent to 39 percent). Scott is ahead with white likely voters (56 percent to 42 percent), men (54 percent to 43 percent), and seniors (51 percent to 47 percent). Scott, who worked to woo Latino voters during both his tenure as governor and his Senate campaign, does not seem to have built significant goodwill statewide among a group that makes up 15 percent of the likely voter sample in the poll. Scott’s favorability rating among Latinos is 39 percent favorable, 49 percent unfavorable. That’s a more negative net rating than the 42 percent favorable, 45 percent unfavorable rating that Latinos give DeSantis, Scott’s fellow Republican. Both Republicans and Democrats express a high level of enthusiasm for voting. Among both Democratic and Republican registered voters, 82 percent say the midterm election is very important. That’s a level of intensity that has been reflected in early voting in the Sunshine State. More than 4.3 million ballots have already been cast in Florida via early or absentee ballots, more than any other state in the country, according to data provided by TargetSmart. In the poll’s sample, 45 percent of likely voters said that they have already voted. Of that 45 percent, 54 percent said they had voted for Gillum compared with 46 percent for DeSantis. That’s the same margin as in the Senate contest, with 54 percent of early voters reporting support for Nelson and 46 percent supporting Scott. The live-caller NBC/Marist poll of Florida was conducted October 30 through November 2. The margin of error for all adults is +/- 3.8 percentage points. The margin of error for 917 registered voters is +/- 4.1 percentage points, and the margin of error for 595 likely voters is +/-5.0 percentage points.